Q: A letter to Qu Yuan Chinese Poet (340 – 278 B.C. ): A Journey of “Circles” and “Squares”. I am writing Letters to Dead Poets travelling through the alphabet from A-Z where each letter is a stop along the road. In so many ways, we have formed something of an arranged marriage. You see, I didn’t know any poets starting with Q and found you through a random Google search. So, instead of going through more traditional avenues to meet, we met online. Naturally, this is quite a different experience but does it make it any less valid? I don’t know. After all, is it destiny or chance which has brought me here, travelling back in time to Ancient China 340 – 278 B.C.? That’s why I’m here. I need to find out. Kayaking Through LI SAO (The Lament). Lacking a time machine, I’ve boarded my kayak and I’m travelling back in time along your epic poem: LI SAO (The Lament). I understand that you probably wrote Li Sao while living in exile South of the Yangtse River. There is some debate about what LI SAO means. It’s been interpreted as: “encountering sorrow”, “sorrow after departure”, “sorrow in estrangement” while others claim it was the name of a certain type of music. In any case, your poem is bringing us together, carrying me across the boundaries of time and place. So, although we live so many, many worlds apart, why couldn’t we swap our skins and get a feel for what it is to see through each other’s eyes, walk in each other’s shoes and wear each other’s skins? Trade places and breathe in each other’s air? Sing each other’s song? I know it sounds crazy, impossible and even ridiculous. Indeed, I can picture us now in a change room, trying each other on in front of the mirror and just how weird it would feel. It wouldn’t surprise me, if I am a lot taller than you and that you’d look something like the saggy baggy elephant lost inside all those folds of skin. On the other hand, your skin would be stretched as tight as a drum and would inevitably rip as soon as I tried to sit down. That would be particularly hard to explain. Yet, perhaps the biggest hurdle of all is how we’d adjust to life in our different worlds. Fast forwarding and reversing over 2000 years, would have to be the ultimate head spin! So, here we are. I’m in my kayak and you are the river. What are the words you speak? Even though our meeting has been designed, arranged or even forced, can we find some common ground or will this “marriage” immediately end in “divorce”? Indeed, I’m very conscious that we’ll barely have a chance to meet before I’m forced to leave. My time is brief and LI SAO (The Lament) has 373 lines and about 2400 characters. Unfortunately, I can’t simply stop and contemplate the wax and waning of the moon. I must move on. So, I can really only dip my toe in what really is a vast expanse. “A circle fits not with a square design.”…That line really spoke to me. Bound us together as one. Indeed, we have a modern phrase: “you can’t fit a square thing in a round hole”. This is most definitely me. While I can’t be entirely sure this phrase wasn’t in effect “added” via the translation but no doubt at least the meaning was there. While our experiences of exile have been different, I know what it is to be a circle. So many of us do in our own way, which I guess makes us a community of circles. While we might not stack up as efficiently as the squares, is efficiency more important than creativity and imagination? That ability to think outside the square to create and innovate? You probably know my answer. Besides, while we circles might not stack, we definitely roll. Move. Grow. We’re not all stacked up on one top of the other filed in alphabetical order. It’s quite difficult to budge a square. It’s been really interesting to see how much two random strangers can have in common, even when there is seemingly so much difference between us. That there is a common thread of what it means to be human extending from the distant past and heading off into the future. That is a beautiful thing. Alas, as much as I’ve relished our journey together, the train whistle’s blowing and it’s time for me to leave. Perhaps, you would like to visit me and raft along my poetry some time. We could even go for a walk along the beach and contemplate the waves. It would be wonderful to pause with you when we could simply stop. This entry was posted in Compassion, Poetry, Quotes, Travel and tagged ancient history, China, Chinese, Chinese Poetry, Harper Lee, poem, poet, poetry, Qu Yuan, road less traveled, travel on April 20, 2016 by Rowena. Racist Attacks on Adam Goodes: The Tip of a Very Ugly Iceberg? During the last week, what I hope is most Australians, have been rocked by ongoing racist remarks leveled at Adam Goodes, a much loved and honored Indigenous Aussie Rules (AFL) footballer and who was also named Australian of the Year 2014. Many have come out strongly supporting Goodes, including setting up the hashtag #IStandWithAdam. However, there are still some pretty vocal critics. Adam Goodes (born 8 January 1980) is a professional Australian rules football player with the Sydney Swans in the Australian Football League (AFL). Goodes holds an elite place in VFL/AFL history as a dual Brownlow Medalist, dual premiership player, four-time All-Australian, member of the Indigenous Team of the Century and representing Australia in the International Rules Series. In addition, he currently holds the record for the most games played for an Indigenous player, surpassing Andrew McLeod’s record of 340 games during the 2014 AFL season. I don’t know whether this story has made international headlines but it has reignited race debate here and personally, I think it’s about time racism made the front page and wasn’t hidden in the small print. Whether you believe that booing at Adam Goodes was racist or not, that doesn’t deny that our Indigenous Australians as a whole, cop what is often vile racist abuse. That what happens at a football match is just the tip of a very ugly iceberg. That there is endemic discrimination against Aboriginal people here and it has to stop! Moreover, you don’t have to be an Indigenous Australian to see this. You just need two eyes, two ears and a heart…values. Even the smallest child has probably heard of the Golden Rule: Treat others as you would like to be treated and that certainly doesn’t include calling anyone an “ape” or saying they “belong in the zoo.”!! 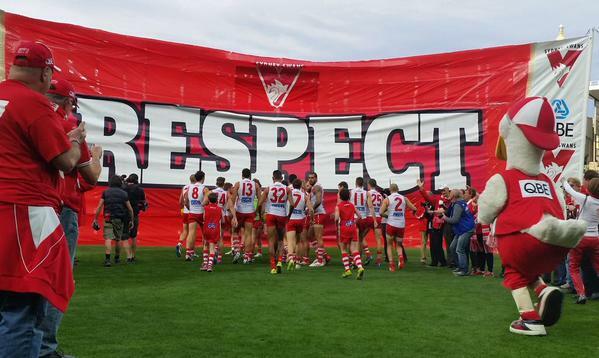 These racial taunts have been leveled at Adam Goodes from the crowd at games and it is nothing short of a disgrace! I am not going to address the details here as you just need to do a quick Google search to get the run down. The story started out back in 2013 when a 13 year old girl at a Swans match called Goodes “an ape” from the stands. Goodes confronted the girl and she was removed from the stadium and interviewed by Police. Goodes didn’t want her charged and she later apologised to Goodes and made amends. However, there are still rumblings from the sidelines about this. That Goodes was unfair to expose and out her and whether a 13 year old knows what is racist. This has taken the issue way beyond Goodes and the girl concerned and has launched a wider debate. Not so much saying that the girl should be charged but that Goodes made the wrong call. Since then, there have been other racial taunts directed at Goodes as well as a lot of booing from the crowd. 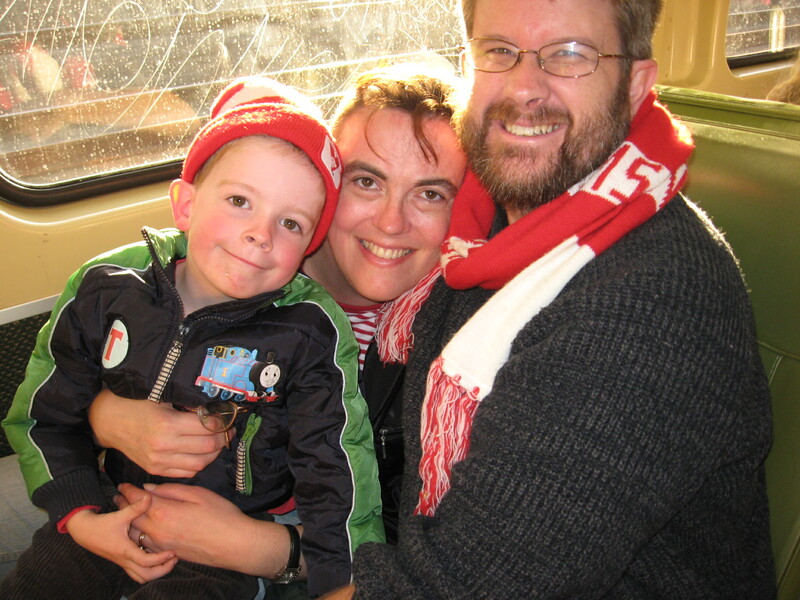 On the way to see Swans vs West Coast Eagles at ANZ Stadium in 2009. Mister played on the field with his team at half-time as part of the junior Auskick program. I’ve been to a number of AFL matches and am a Sydney Swans supporter myself. I’ve heard that kind of booing at matches and know how a crowd can get carried away, However, even then it struck me as poor sportsmanship and this booing at Goodes falls into another category altogether. Even if it wasn’t intended to be racist in the past, now that it is being perceived that way, that’s what it means. It needs to stop!! 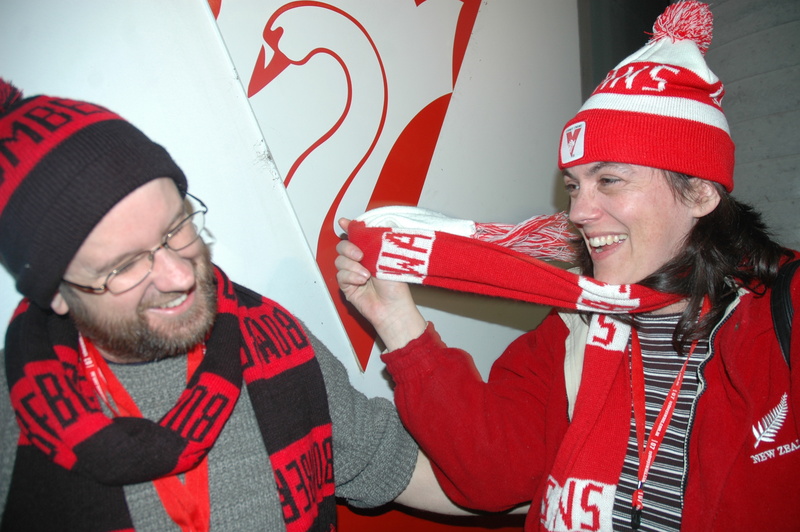 Somewhat friendly banter between opposing supporters at the Swans vs Essenden match July 2007: my husband and I! What I also find quite intriguing is how people talk about this girl being an “innocent 13 year old”. That she didn’t understand what she was saying. What it meant to call anyone a “ape”, even if she didn’t understand what that reference means to Aboriginal people in particular. As far as I’m concerned, she knew exactly what she was saying. You and I both know that if anyone called a kid in the playground a ape, at the very least, they’d be labeled a bully…not an innocent. So what’s the difference here? Just because Goodes is older than her, that doesn’t give her the right to be racist! Just to emphasise this point, while I’ve been working on this post, my daughter approached me and said: “How could she not know that calling someone an ape is racist?” Miss is only 9 and she knows! My kids are incredibly proud of our Indigenous people and actually thought they were Aboriginal. You see, my aunt’s partner is Aboriginal and they simply know him as “Uncle Darryl”. Darryl’s children are my step-cousins and while we don’t see them often as we live on opposite sides of the country, the kids really became attached to Uncle Darryl and believed they were Aboriginal. Even when I tried to explain to them that we were related to my aunt, it simply didn’t sink in. They couldn’t grasp genetics and all of these scientific explanations. Darryl was their uncle. He is Aboriginal. They were Aboriginal. There was such beauty and love in this. One day my daughter finally asked me: “So we don’t have any Aboriginal blood? Not even a drop?” Both kids are very disappointed! I don’t just attribute this pride to our family situation. Rather, our school has built close ties with the local Mingaletta People and they learn Aboriginal painting and stories at school. Indeed, Aboriginality is truly celebrated at our school and not just given lip service either! It is interwoven in so much of what we do. A few weeks ago, my son even attended a didgeridoo playing session at Mingaletta with his friend from school and I know that moved him deeply inside. It was a spiritual experience for him. A few weeks ago while we were catching the train, he also told me that he would be proud to be Aboriginal. These weren’t things my kids have said or done to be politically correct. Their love and respect for Aboriginal people just flows from the heart as a mark of respect, love and I some sort of connection which defies explanation but I do hope that this is something which will nurture and grow. My kids, imperfect as they are, show what is possible not only through education but through knowing Aboriginal people in our family, at school and in the community and also being taught over and over again that we are all equal regardless of race,gender,disability or class. My question and what I see as the ultimate challenge, is how do we reach adults who espouse racism and the like in our community? Quite frankly, we all need to periodically scrub our brains out with soap and clean out the crap. Acknowledge our own bigoted biases and change the way we think. This doesn’t just relate to racism but also just to plain snobbery. Thinking that you’re better than someone else just because of where you live, what you drive and where your children go to school NOT who you are on the inside and your own actions. We don’t need to knock other people down to build ourselves up. So along with the rest of my family, we step out firmly supporting Adam Goodes. More than that. We cheer him on for taking a stand against racism and also for all he has done to encourage, develop and support Indigenous Australians while promoting greater acceptance, understanding and connection among all Australians…and all peoples! This entry was posted in Parenting and tagged Aboriginal, acceptance, Adam Goodes, ALF, Australia, Australians, bullying, Harper Lee, love, Martin Luther King, parenting, racism, racist, Sydney Swans on August 3, 2015 by Rowena.